Barack Obama and Vladimir Putin met today at the G20 in Los Cabos, Mexico. Much has been made already regarding their body language by the press and Mike McFaul, the American Ambassador to Russia. McFaul, who of course knows Putin, stated that "That's just the way he looks. That's just the way he acts." Ben Rhodes, Obama's Deputy National Security Adviser also cautioned about "trying to decode body language." Well, either these men are rationalizing what they want to believe (and what others to believe), or they're naive - or both. While "norming" someone's (Putin's) baseline nonverbal behavior is very important, and should certainly never be ignored, the body language exhibited today (at least that made public) was indeed reflective of emotional distance and lack of rapport. Lack of eye contact between two World Leaders (or any two people) is a rapport destroyer. Period. If one cares about statesmanship - and we hope both Obama and Putin do - eye contact should occur from 30 to 70 percent of the time. This tends to drop off in the speaker and increases in the listener. Avoiding this transient relative decrease of eye contact by the speaker increases rapport and the ability to influence the listener. In the video segment included above, notice how Putin is leaning away from Obama with his arm as additional barrier (hand gripped on armrest). 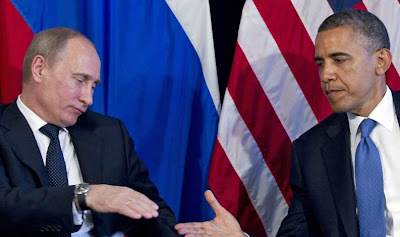 Putin is disengaged and distancing despite Obama's lean towards him. After the handshake Obama commits a body language faux pas that many leaders do - he grabs Vladimir's upper arm. Dominant, alpha personalities feel superior when they do this, but in the vast majority of circumstances this action nonverbal alienates and destroys rapport. It makes Obama feels better while Putin feels worse. Putin is six inches (15.25 cm) shorter than Obama. Even if the Russian President were taller, the gesture should still be strongly avoided. Given their difference in stature, the upper arm (or shoulder) grip is particularly patronizing and condescending. False intimacy is disingenuous - especially with ex-KGB agents. Making a short person feel short is not good diplomacy. Making an adversary feel weaker will only make them dig in their heels and not budge on .... hmmm, say the Syrian Crisis? Everyone has pride and Russians are not exempt. Notice the Inward Lip Roll (ILR) Putin displays immediately after the President embraces his upper arm (0:20). The ILR is a signal of anger-anxiety. His psyche is trying to squelch negative feelings. Putin abhors what just happened. If Obama were insistent on grabbing the Russian leader's arm-shoulder, he should at least look toward Vladimir when he does so - he doesn't do this though. Obama looks away. This is insincere. Putin immediately responds by his ILR and looks away as well. While there are some variations between culture and individuals, the vast majority of body language crosses all cultures, ethnicities, socioeconomic divisions, religions, ages and countries. Later in the video, Obama displays the same upper arm grip with Mexican President, Filipe Calderon. The Mexican leader needs the U.S. more though, so it doesn't bother him. He's the host country leader and he's there to build bridges. Calderon, quick on his feet, counters Obama's move by mirroring his arm grip (1:43 - 1:46) - which is exactly what Putin should have done.